I am a comedian and magician that performs clean comedy material. I have also sold over 1,000 jokes, along with scripts and song parodies. 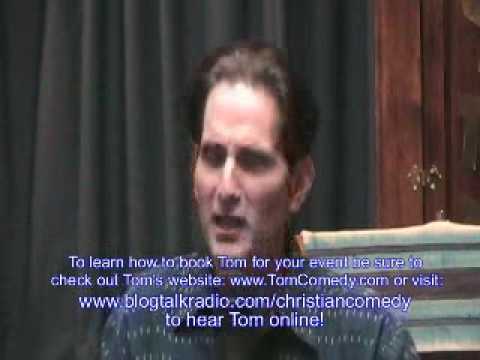 I have performed clean and/or Christian comedy in churches, on cruise ships, at comedy clubs, conventions, resorts, senior facilities and many other venues. I have lectured on comedy at the Las Vegas Ventriloquist Convention. I have written and sold joke books. I have also performed at birthday parties, graduations, and many other occasions, writing and performing material for the client's specific needs. Have performed as a magician doing shows for children, adults, and both. Have done MC work. THANKS TOM you did great. Thank you Debbie! It was an honor performing at the pastor's birthday celebration! Tom thrilled my audience with timely and appropriate jokes that suited a wide age range. I was happy with my selection not only because of his talent, but also because of his professionalism with showing up on time and communicating with me pre and post the gig. A clean comedy show that can be written for the client's specific needs. I can also do audience particpation. I have an item called the Ventrilomask that I put on a member of the audience and have that person as part of the routine. I do a clean comedy act and I can come up with original material for the specific need of the client and event. I have been performing and writing comedy for over 20 years. If desired I can even give my Christian testimony as part of the show, and have done so in the past. I have performed at churches, in comedy clubs, on cruise ships, conventions, and many other venues. I have also sold over 1,000 jokes and have worked with comedians and ventriloquists to help them improve their act.